Cartridge change is so easy it's almost no fun. Just screw off the old cartridges and screw on the new ones. No tools or lubricants needed. Not a drop of water spilled. 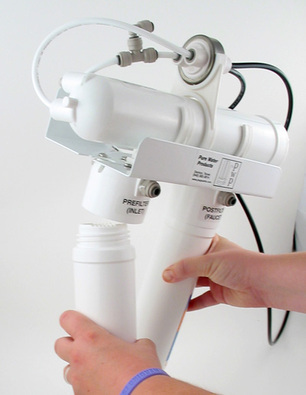 It's the simplest and most straightforward RO (reverse osmosis) unit made. No frills. It's made for performance. The filter cartridges are the tough and effective Omnipure Q Series. Used everywhere commercially, they're easy to find, easy to replace. They never leak, and you can replace them without spilling a drop. No tools are needed to service the filters. The unit is capable of making up to 36 gallons of water per day. That's more water than a dozen average sized families need. The membrane refills the storage tank when water is taken out at the rate of about 1.5 gallons per hour. The filters are extra large. 12" long, for extended performance. No tools needed to service the unit. Servicing the tank requires one high-tech tool — a bicycle pump. In the unlikely event that you would ever need to return it to us for service, simply removing the cartridges makes the entire unit fit into a shoe box for easy shipping! As with other products we sell, we offer complete phone support for installation, cartridge selection, and repairs. Two year guarantee covers everything but the replaceable filters and membrane, but the unit should last virtually forever. There's nothing on the unit that you can't fix yourself. Standard faucet is the Tomlinson Pro-Flo, an extremely dependable faucet. But if you want an alternative, we offer some stylish choices on our faucets page. We'll match the inlet valve to your undersink plumbing. You'll be surprised how easy this makes installation. Clearly labeled so that it's easy to install, easy to service, and easy to talk about on the phone. Alternate tank, faucet, and cartridges available. Call for details. Uses the same metal storage tank as our top quality Black & White units. When it comes to installation, it's a very versatile unit. Though it normally hangs on the wall, it can lie on its back, or simply be wedged into a tight spot under the sink. Standard postfilter is coconut shell carbon for great tasting water. The Q 36 units use the same Payne control system that's used on our super performing Black & White units. Includes a John Guest check valve in the drain line for backflow protection. It's light weight, which makes installation a snap. The built-in check valve and flow restrictor also make changing to a different membrane size totally hassle free. We can supply other membrane sizes upon request that will snap right in to your existing unit making it capable of up to 150 gallons per day! Performance is great. The post filter is a top-grade coconut shell carbon in the extra-length version. The prefilter is a CTO 10 micron carbon block, acid pre-washed to protect the membrane at startup. The two carbon filters are rated for 3,000 and 2,500 gallons of chlorine reduction, respectively. Coconut shell carbon is regarded as best in the in the industry at removal of volatile organics, chloramines, and at taste improvement. The 12" coconut shell carbon postfilter produces great tasting water! High capacity cartridges make it unnecessary to service the unit more frequently than once a year. We offer two distinct "cartridge packs" for each unit to make changes easy and economical. Annual upkeep of the 3-stage unit costs as little as $29. We encourage recycling one of the cartridges for a second year. The cartridge packs make this easy. The concept is explained in greater detail in Q Series Cartridge Logic. We stock complete parts for these units, every nut and bolt, and provide great phone support if you need to fix something.